Summer is the time for Champion Athletes With Diabetes. Hello Athlete… Competitor… Iron Person… Runner… Biker… Swimmer… Game-Changer… and also, Person With Diabetes. It has not slipped past me that we are entering the height of activity season in North America and Europe. Many of you are out there working hard every day to get ready for a big event: A 5k run, a long ride, a triathlon, or something else you’ve been wanting to participate in since there was frost on the ground. Maybe the most inspirational athlete you know is the one close to you who is living with diabetes, and their story is worth celebration and reward. We’ve given away 27 of these babies to Champion Athletes With Diabetes who reach their athletic goals while dragging along diabetes at the same time. D-Athletes are special, from Ryan Reed, winner of the XFinity series NASCAR race at Daytona this year, to Bob Parant, who made it 65 miles after losing part of his leg, to Janie in Ohio, who completed her first 5k last year after more than 40 years with Type 1. And trust me when I say, all of our Champion Athletes With Diabetes have stories that are just as inspirational. 2. The athletic event must have taken place in the last six months. For now, we’re going with a pretty loose interpretation of the word “event”. If you feel you’ve accomplished something important to you, that’s an event. ‘Nuf said. I’m also semi-flexible on the dates. In other words, don’t stress over this part. I think D-Athletes are amazing. If it’s a big deal to you, it’s a big deal to me too. 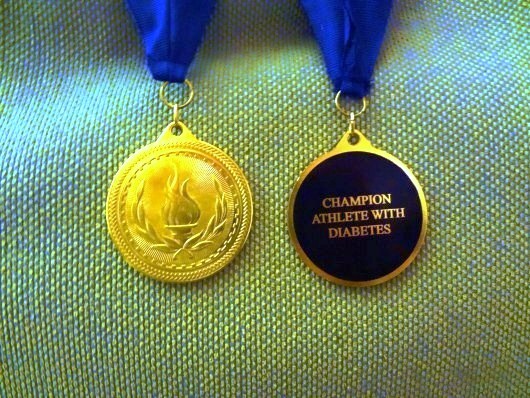 I want to support you, or support the Athlete With Diabetes in your life. « The DOC as an information source. I just recently found out I have diabetes. Thank you for encouraging myself and others to continue to be as active as we can.